This lorry sat on the side of the street for the entire time that I lived in Half Assini in the Western Region of Ghana, from 1971 to 1973. I was told that it was waiting for repairs which was not surprising since that was a time when vehicle parts were very much in short supply in the country. The roadside fitters were (and still are) very adept at finding ways of keeping vehicles on the road, often fabricating replacements from a variety of unlikely sources. At times, even their ingenuity encountered situations which were impossible to remedy without original parts. 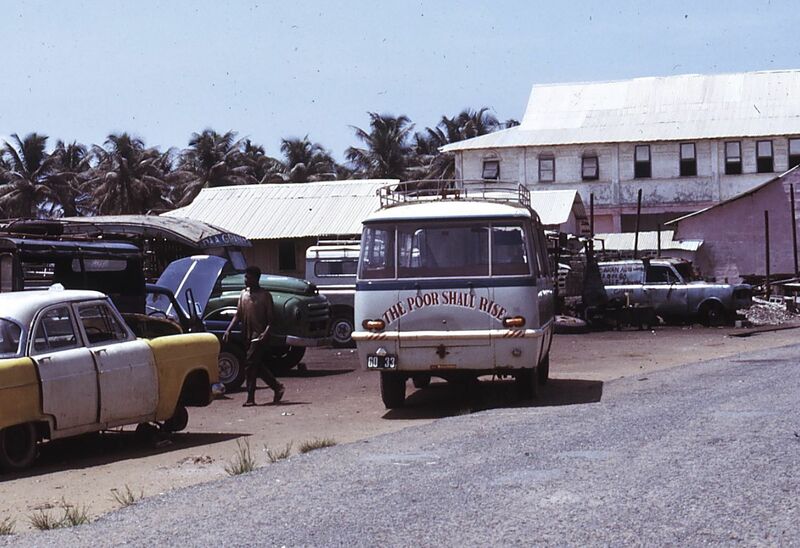 The effect was to leave drivers and their mates without jobs; the lorry owner unable to earn anything for his investment; and villagers with one less means to get to market. I have been particularly fond of the slogan on this lorry because it speaks to the indefatigable faith that so many people exhibit when faced with hardships. In spite of continuing challenges, the village people of Ghana continue to demonstrate that faith, and in that I find a great deal of inspiration. “the entire time”….the lorry was broken down…guess those you mention…driver, mate and owner…didn’t rise up…the lorry is an apt metaphor for most Ghanaians here on earth. Maybe the saying should read, “THE POOR SHALL RISE TO HEAVEN”.